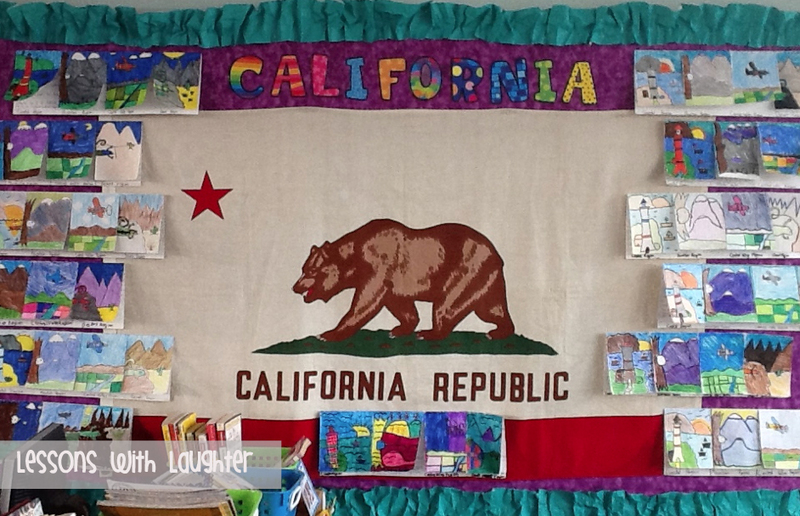 I LOVE teaching about California history because I grew up in Illinois, so when I started teaching 4th grade, I learned all kinds of new things about California that I didn’t know before! And no one knows how to teach CA history better than my good friend LeAnn! She has been teaching 4th grade for a while and has tons and tons of fabulous ideas on teaching social studies! Whenever I meet up with her I always leave with lots of great ideas that I can bring right to my classroom! The kids have SO much fun making these! 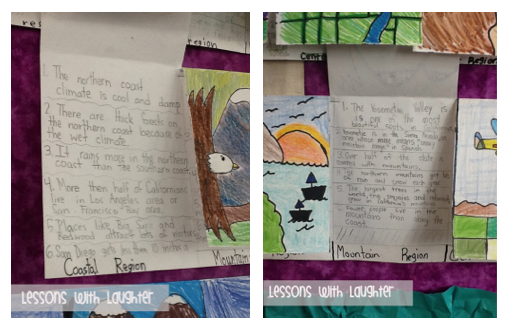 As we read about the regions in our social studies textbook, the students write down 6 interesting facts about the region and specific places that are in that region. 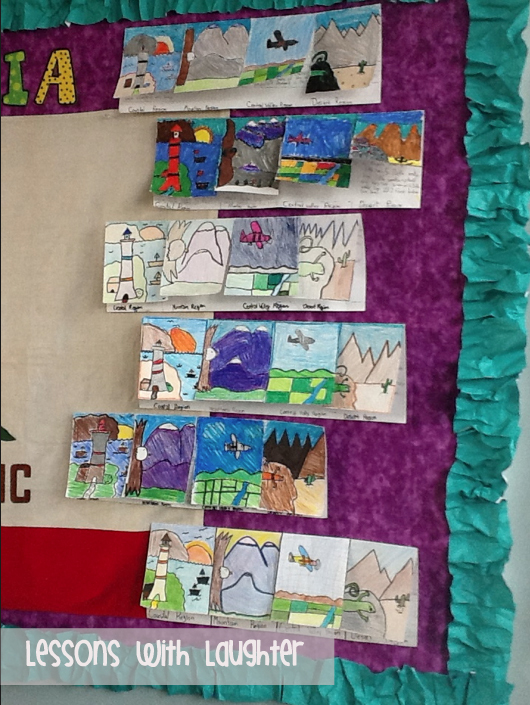 Then we do a directed draw that goes along with each region on the outside of the foldable. The directed draws are so easy and my students always do such a great job on them! I love how surprised they always are with how good their drawings turn out! That looks awesome!! Also I didn't know you were from Illinois! IL, what what! Looks great. I love CA history. I think that would be the best part about teaching 4th. I love this idea! 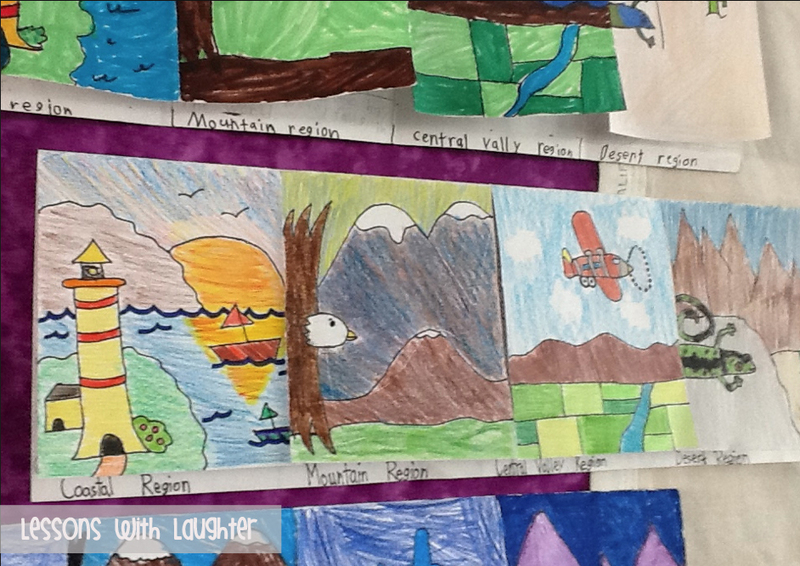 We are learning about the different regions right now! Help! Can you tell me how you do directed drawings of the regions? Do you have a resource for this? Thank you! Hi! I just responded to your comment on facebook, but I figured I will reply here as well! I don't have directions, I just go off the pictures! I got the idea from my friend and she gave me a previous student's to use as a sample! Hopefully you can kind've see the pictures from above and use those to do the directed drawings! Thanks for getting back to me! Do you have each student do a different region or do they all do each region? They all do each region! Ok. I am just seeing that these are a foldable. Did you use 11 x 18? We are doing this today! I can't wait to blog about it and link up to you! I am like Mrs. Tyner. Needing lots of instructions about these foldables. Would you be able to post a picture of each region? Maybe a close up of each one? I am so much in need of remedial help. I want to teach next door to you and LeAnn. Any help is most appreciated. I am new to 4th grade. Hi!! I hope you are loving 4th grade! We just finished making these with my class this year, so I took some close up pictures today! I am planning on working on a post with them for either Friday or sometime this weekend! Hopefully that will be helpful for you! And LeAnn is amazing! I've gotten so many wonderful ideas from her! Hi there! Where can I find the up close pictures of the direct draws?